on the woodside. : *kid's table. Monday, February 09, 2009 Labels: cookery. Sometimes I find it utterly baffling that I could be considered a grownup. I didn't understand it, with all its mysterious bill paying and work going and house owning, when I was a kid. And I don't fully grasp it now. Sometimes, when I'm at the grocery store, I'm seized with this sense of confusion—unrelated to the man who, apparently rhetorically, approaches you in the line and inquires if you'd like to buy some sugar for a penny—that I should be allowed to drive my own car, fill my own cart, and pay with my own money. Maybe it's a singlehood problem. It's just me! I don't answer to anybody; nobody is invested in my choices. This explains why I generally engage in grownup activities (filling my larder, washing my clothes, corralling the dust bunnies) on a seldom-to-never basis. J probably has an opinion, but neglect is making him squirrelier by the day so I'm not sure I trust it. ALL of which is to say that my life has been exceedingly adult lately—working late hours, handling car/plumbing repairs—so when I pulled this off last night after a 10-hour day at the mine, I was ... kinda floored. I am 29; hear me roar. Lately I've been craving sushi in the worst way, but economic factors conspire to make beautiful sushi-grade fish out of my financial reach. Ergo I cry salty, salty tears. But I'd seen Heidi Swanson's Sushi Bowl at 101 Cookbooks, and she says it tastes like a "de-constructed sushi roll." Firstly: 2 cups of brown rice into 3.5 cups of water on to boil. 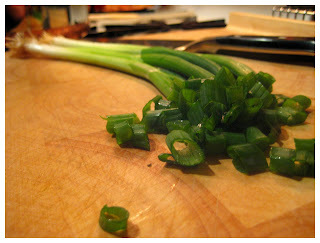 Then green onions—scallions if you're nasty—chopped. I was a little nervous about the amount of orange called for (juice and zest of 1 whole), because I'm not a big orange fan, as flavors go. Navel oranges make me happy, though, because they have silly little bellybuttons and NO SEEDS. If you flirt with my laziness, you shall be richly rewarded. Technically there was supposed to be the zest of 1 lemon but only the juice of half, but I threw the juice from the whole lemon in there. Because I do not, as we know, pay attention. 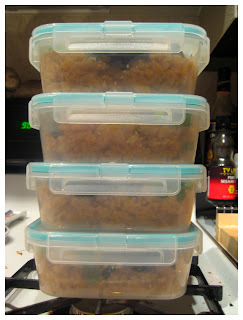 The best part about this recipe is that the rice is cooking away, with no need for attention, for 45 minutes. So you have that time to prep the rest of the ingredients AND clean up after yourself along the way. It's more muted when it goes in, but it comes out toasted and obsidian, with an iridescent sheen. So you take those pretty scrolls and break them to pieces. Heidi says you can either coarsely chop or tear them. After failed chopping attempts, I discovered the easiest thing was just to crumple the sheets into a ball like loose-leaf paper. 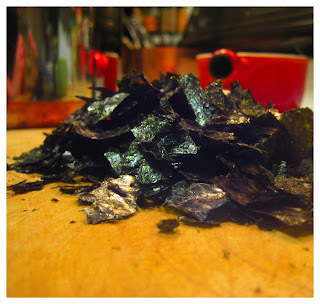 They break into lovely shards without looking too perfect. Which I studiously try to avoid, of course. Into a dry pan goes 3 tablespoons of sesame seeds over low heat, where they release their oils and get golden and warm and toasty. 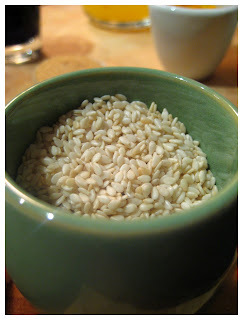 Running your fingers through a bowl of warm sesame seeds should be a form of tactile aromatherapy. 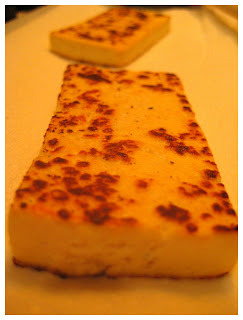 After the seeds toast, the tofu goes into the same dry pan to firm up and brown. Note to self: Do not have photo taken in oven lighting. This is maybe the best tofu-in-a-homemade-dish I've ever had (LSis's tofu parmesan notwithstanding), and still? There's not much to say about a block of soy. It just ... is. I mixed together the citrus juices with 2 tablespoons each brown sugar, shoyu, and rice vinegar, and boiled it for a few minutes until it reduced slightly, then mixed about 1/3 cup into the rice. 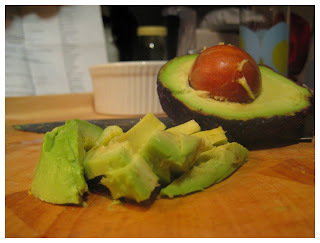 At the last minute, I sliced the avocado. And: assembly. 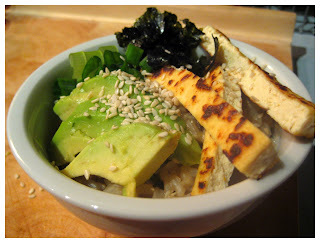 Citrusy vinegar rice, tofu, scallions (yeah, I am), avocado, and toasted nori and sesame seeds. So delicious. 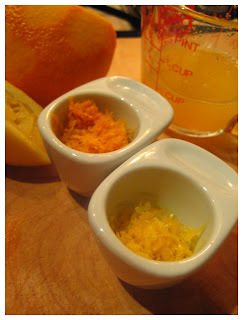 If you're keeping track, you'll notice nothing ever happened to the lemon and orange zest. That's because I forgot them, because that's how I do. It's that whole pursuit of imperfection project I have embarked upon. I mixed it into the rice later, and none was worse for the wear. Heidi says this serves four to six people, but I think you'd have to find a pretty hungry trio for that to be the case. I was pleased to discover I'll be noshing on this for the next week. You're supposed to add more dressing as desired, but I kept the last 1/4 cup or so to marinate the leftover avocado in, thereby staving off the leprosy avocado is prone to contracting. THEN, after roughly two months of stress-related sofa surfing, I slept through the night in my own bed. Sounds wonderful. 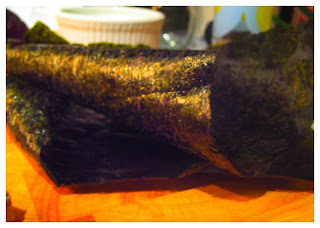 Feel free to use those other nori thingys here and make this for ME!